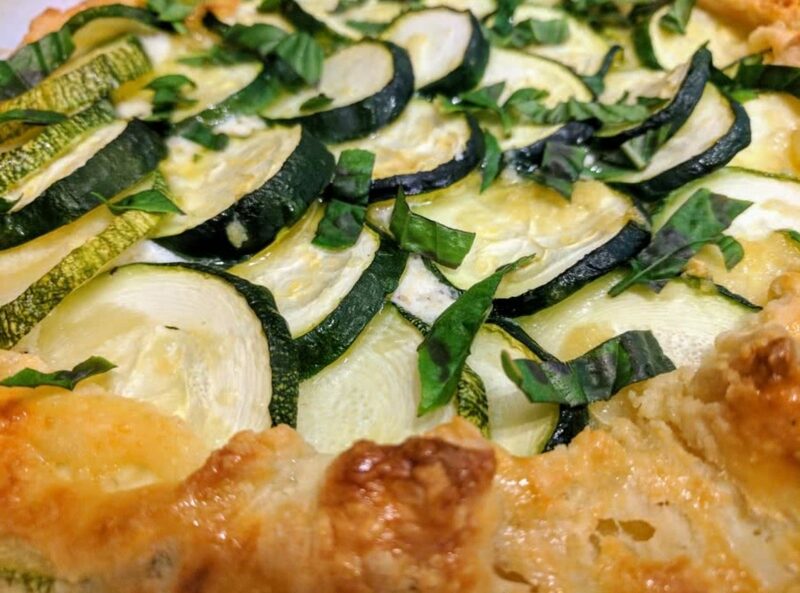 This recipe really hits the spot on a warm summer evening, melding savory pizza tasting notes with the lightness of the zucchini and the ricotta. The recipe could easily feed two without a side or an appetizer, as it leaves you feeling full without the heaviness of a traditional pizza. If you are looking for a zucchini recipe that is not loaded down with tons of sugar, look no further! We used fine sea salt and it worked perfectly. We were not sure what the recipe originally intended, but this worked great. Making the dough at least an hour ahead of time helps to ensure that the dough is property rested and chilled. Ensure that the butter is pea sized or smaller, if they are too large they will burst and create a mess of smoky butter in the oven. Do not be overly liberal with the application of the egg yolk glaze on the dough. You can definitely have "too much of a good thing" with the over application of the glaze, which creates slightly unpleasant crunchy bits. Bake time is definitely in the range of 30-40, we baked closer to the 40 minute mark but felt that it could have gone for just 35 minutes.